Mikko started his blog within a few days of me starting this one, over nine years ago, in 2009. Some sort of “You may also like…” browser or site function somewhere connected the two of us and we have been chatting regularly ever since. 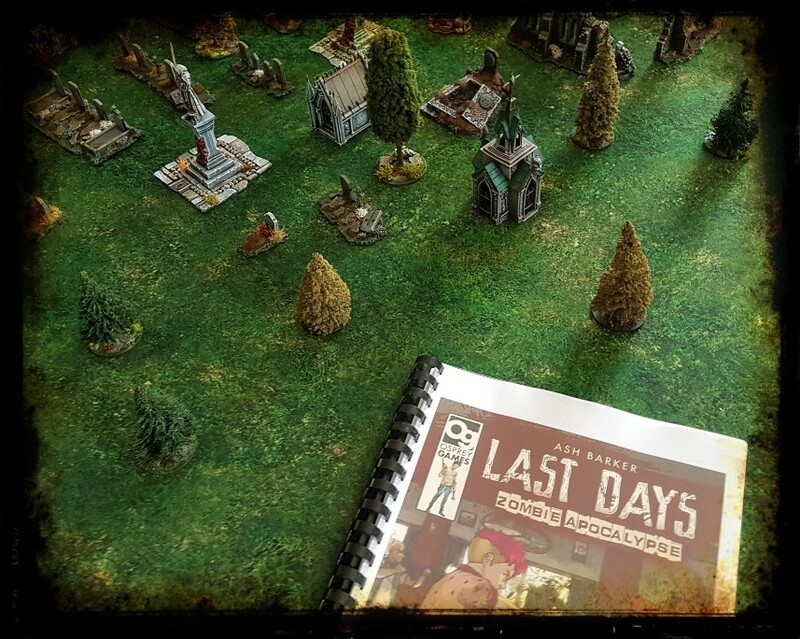 Back in pre-Zombicide, pre-Kickstarter, pre-The Walking Dead tv show 2009, we were both particularly interested in zombie gaming, so I picked up a copy of Ash Barkers “Last Days” brand new rule set to try out this weekend when Mikko visited. St Craniums Cemetery featured. Even pseudo science zombies tend to dig hanging around in graveyards. Online gaming video channels are a mixed bag. There are some exceptions though, if you can wade through the dross until you find the good stuff. 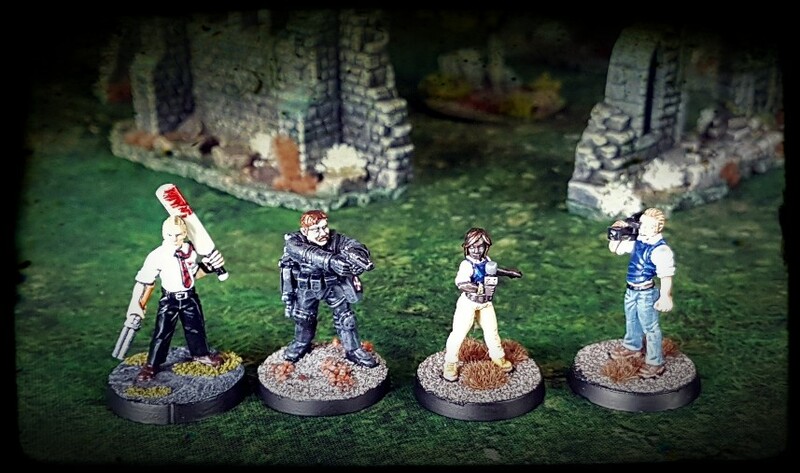 Guerrilla Miniature Games is the good stuff. 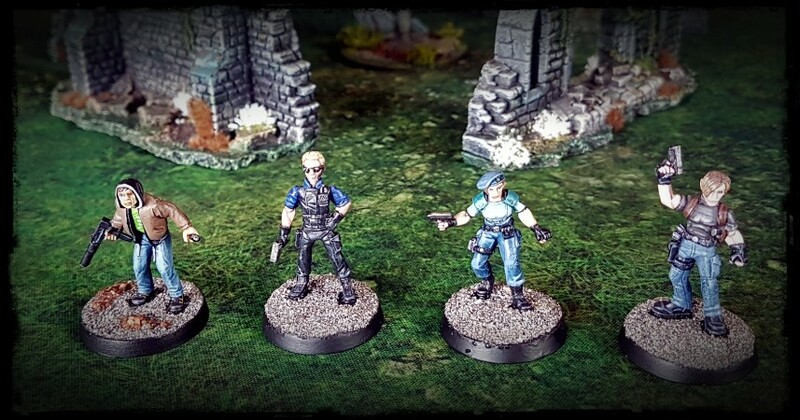 Ash Barker – Mr Guerrilla Miniature Games – gets to the point and conveys the information enthusiastically, without being annoying. He also speaks and plays games rapidly, which is absolutely critical in a medium where succinct transfer of information is the entire point (but usually ranks behind everything else). … I bought the hard copy rulebook and the PDF last Friday, printed it out and played a quick game on with Mikko on Saturday. “Jam it up your swiss Albert”. … while I picked a group of super badass, yet comically naive Trained Professionals in the form of S.T.A.R.S. and, amusingly enough, me. Mikko read the rules while I got the game room ready and we ripped through the benchmark “Scavenge” scenario quickly and easily. Very easily considering it was our first game actually. Leon and Wesker keep a wary eye on each other as they hunt for supplies. The game uses a system with a consistent target number. I liked that. The zombies are straightforward to slow down, but difficult to put down (none of The Walking Dead series inevitable headshot syndrome). I like that too: zombies are best relentless and difficult to stop. A former fireman still feels an affinity to bottles of water, bottles of water that Leon isn’t going home without… probably. The force selection is driven by primarily by character motivation, which feels just right. Rather than have me blather on about it, just watch the second video above to see Ash explain it. 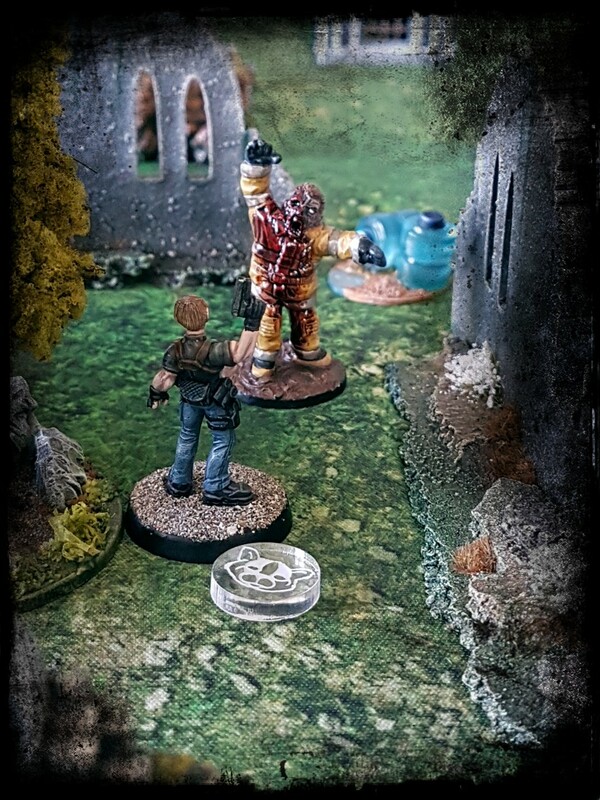 Our one game ended when Pablo (the cameraman from “*Rec”) rather unsportingly put a bullet in Leon S. Kennedy while he defended himself against a former fireman. It was rapid and bloody and felt right. A single short game like that isn’t really enough to draw full conclusions on, but as I am really looking forward to playing more Last Days, then that has to be a good sign. In particular the campaign system looks like a laugh. Those of you with loads of zombies and survivor figures sitting around would be well advised to pick up a copy. It proved to be exactly what two jaded zombie gamers wanted on a Saturday afternoon. Sounds like it ticked a lot of buttons. 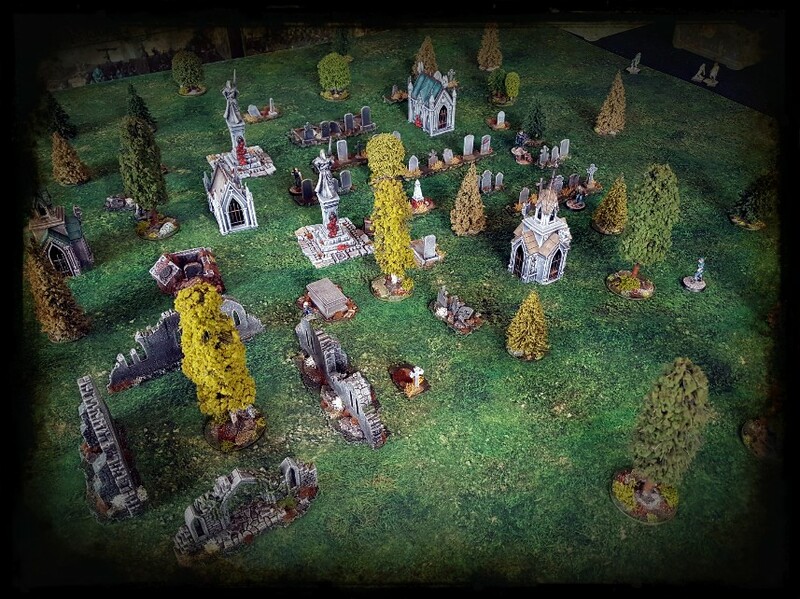 My 20mm zombie gaming project never got off the ground. 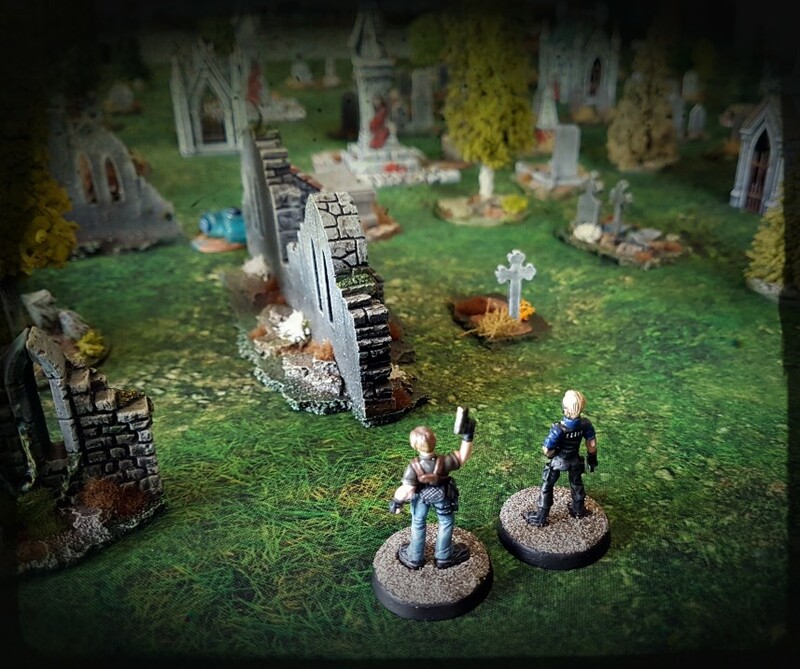 20mm is an excellent way to get zombie gaming really. Get a horde ready fast. It was Mark. I’m looking forward to trying it out again. My experiences with the Zombies!!! game were off putting, due to the length of time that it took to play. I did like a lot of the games aspects though, in particular the city building that goes on with the tile placement. I find something about that sort of thing pleasant, possibly due to connections with Carcassonne or something. It’s too early for me to come down definitively one way or another on Last Days as I have only played one game so far, without any of the ongoing campaign elements, but it looks a lot like what I want. Fun and straightforward, as you say Al. I’m hoping to get another game or two played in a couple of weeks, so I will report back if that works out. We will definitely discuss it at BOYL. I *think* that its the sort of game that you enjoy, if maybe a bit more Lopez than Grove, if you know what I mean. The anchorwoman and cameraman were part of one of the pro-am sculpting sets that the Frothers Unite forum used to organise. I don’t think that they ever went into full production though. I do like that the pair of them are wearing body armour. That’s a good look for zombie games. Such a fun game and trip altogether! Thanks so much for yet again being such a gracious host, plenty of great discussions. I can see more Last Days games in our future Mikko! I may try this. I’ve yet to find a zombie game that does what I want it to. Very atmospheric photography, a pleasure to read as always. 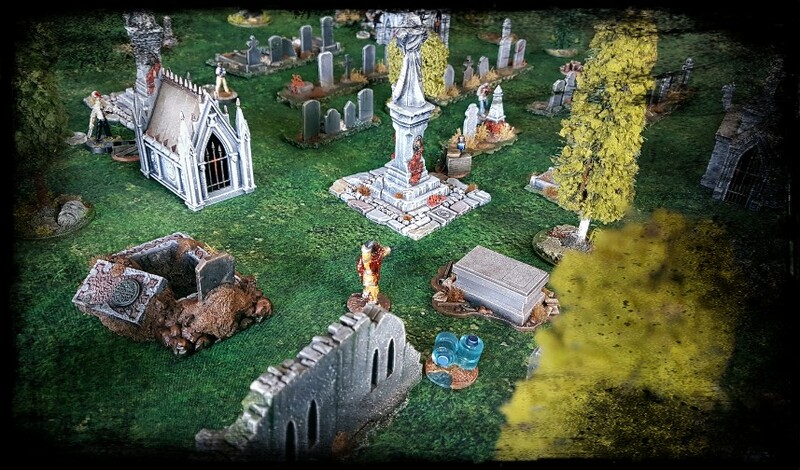 Really like seeing how all your terrain projects I have followed and admired over the years serve you well now in providing a backdrop for nearly every genre of game. I’m not good with delayed gratification, so long term plans don’t tend to motivate me. Having learned from errors with prepping terrain when I was younger, I have tried to make sure that my terrain pieces are fairly modular, hopefully without being too bland. I reckon that its possible to set-dress more generic items with bespoke props to make them fit in different settings. I imagine its a bit like stage management in a small theatre company, but with the bonus of only having to deal with one egomaniac (moi). Looks like fun… good stuff! I quickly painted a full set of LNoE a while back. They are absolutely perfect for a game like Last Days.